Talented actor he may be, but punctuality is not something Johnny Depp is famous for. As I, and several other reporters, waited at a posh Beverly Hills hotel to interview the star of Pirates of the Caribbean: Dead Man's Chest, we were told he had gone to lunch and would be back in his own time. More than two hours late, Depp finally burst in, clearly oblivious to the simmering unease in the hotel corridor where we were left to twiddle our thumbs. But the 43-year-old actor is the ultimate charmer. Casually dressed in his familiar grey hat, he smiled, hugged someone and was ushered into the interview room. We were ready for action. Because the day's schedule had gone hopelessly to pot, we were told that each reporter would have only three minutes with Depp. It would not be an in-depth interview. "You've got a big one," he quipped, as I sat down with a rather large 'gun' microphone, to prepare for our brief chat. It broke the ice. We joked for a second or two and then got down to business. In Dead Man's Chest, Depp returns as captain Jack Sparrow, the lovable rogue of the high seas who sets sail for another rollercoaster of an adventure. The original film, Pirates of the Caribbean: Curse of the Black Pearl, was a huge hit in 2003 - despite what studio executives feared was an overly hammed-up performance by the actor, as the camp pirate with a tendency to mince around the deck. Depp says he never had any doubt over his portrayal of the character. "I don't think it's changed very much from my perspective since the second that he came to life around me. He's pretty much the same guy. This time we get to see a little bit of a slightly different angle on him," he says. The studio's concerns over Depp's unconventional performance melted away as the movie took the box office by storm. "They were nervous and I guess in some way rightfully so, because they had a rather large investment in the film. "And here I came in prancing around, doing the weirdness that I was doing and scared them, but now they're a bit more understanding." "It does feel good to be able to win that battle with the studio, because the whole thing was, 'You've hired me to do this job, this is my area of my work and you're meddling in it and it's uncomfortable.'" 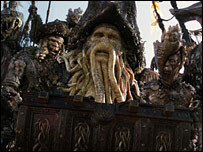 Bill Nighy, who plays Davy Jones, Jack Sparrow's arch nemesis in Dead Man's Chest, believes Depp deserves high praise for moulding his character's personality. "It wouldn't have occurred to anyone else but Johnny to play this part in this particular way, to deliver it in this fashion, it's so original and so witty," he says. "I think he brings a big-heartedness to it - he's an assassin in terms of comedy. It's a master-class technically speaking and he's imbued it with this wonderfully rascally, scampish, lovable sort of quality which is very generous and deeply funny." 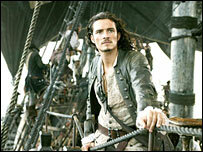 Orlando Bloom returns in the sequel as blacksmith Will Turner, still besotted with his childhood friend, Elizabeth Swan, played by Keira Knightley. "He's really taken the movie to another level," Bloom says of Depp. "It certainly didn't read like that on the page for the first movie and I was wondering how I was going to play opposite him. "They were two swashbuckling pirates but he really created this fantastic character which left me to play the kind of straight guy, heroic pirate-type role which develops more in the second movie than from the first," adds Bloom. 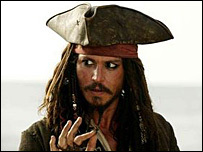 Depp earned an Oscar nomination for his first outing as Jack Sparrow, but he would prefer it if the executives at Disney were still on tenterhooks. "You want to keep pushing and, not that I get any perverse enjoyment out of it, but I think that it's healthy to keep them a little nervous," he says. Early reviews for the film suggest the film-makers have nothing to worry about, with Dead Man's Chest expected to dominate the summer box office. The studio may be resting on its laurels for the time being, but a third Pirates movie is in the works and Depp has a twinkle in his eye. "If the studio's not nervous now, wait till Pirates 3," he says. "We've got some plans."